Ferretti Yachts, one of the icons of made in Italy luxury products worldwide and historic brand of the Ferretti Group presents the new Ferretti 690 project, yet another outstanding result of the working relationship between Studio Zuccon International Project, AYT – Advanced Yacht Technology, the Groups naval research and design centre of the Group, and the team of skilled architects and designers at Centro Stile Ferrettigroup, who continuously research aesthetic, functional and innovative solutions. 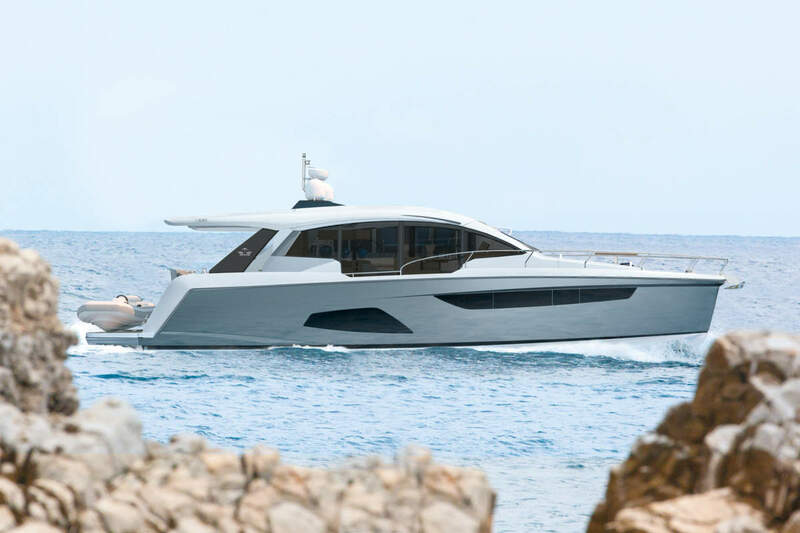 The Ferretti 690, that will be presented during Spring 2012, is a further step forward of the Ferretti Yachts fleet, characterized by the new design of outer lines, which are now sportier, with a sleeker and more dynamic profile. The wider glazing makes exteriors lighter and provides an amazing quantity of natural light to interior spaces. Studio Zuccon International Project has designed the superstructure and the interiors of this model, featuring an extremely catching yacht, a continuous glazing from stern to bow, with increased height in the central part, reaching the gunwale. Large windows lighting up the VIP fore cabin and the guest cabins have been added to the large open view glazing in the central part of the hull, where the Owner cabin is located. The sleek outer lines have been further enhanced by the flybridge, which features an elongated tail with the new small roll bar and the SAT domes recessed lodging, that accommodates the base of the SAT antennas, providing to minimize the aestethic effect of the domes on the profile. 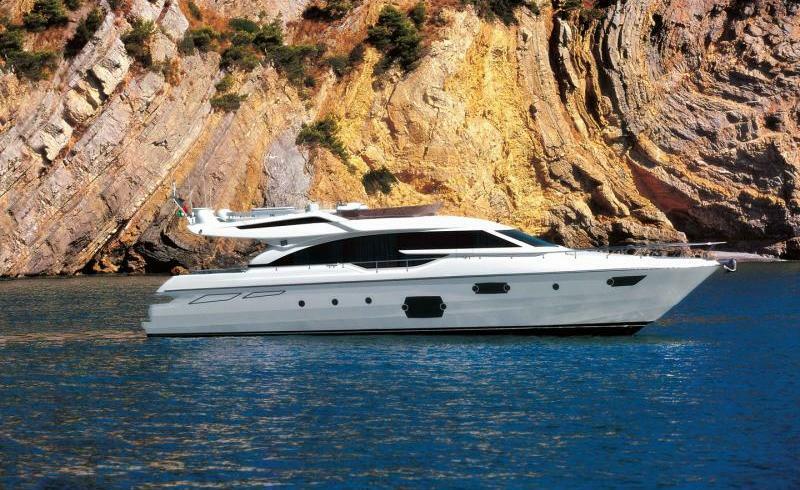 “The Ferretti 690 is the most innovative project under 70 feet ever designed by Ferretti Yachts. This is another step forward in the renewal process of our range” – declared Alessandro Tirelli, Ferretti Yachts Brand Manager. “Ferretti 690 gets to the market as a sporty yacht, though being characterized by a deep family feeling, in line with the most recent models of the brand, which match the classic-contemporary style of Ferretti Yachts with the modern flair of interiors, featuring highly functional spaces, and an impressive external look. 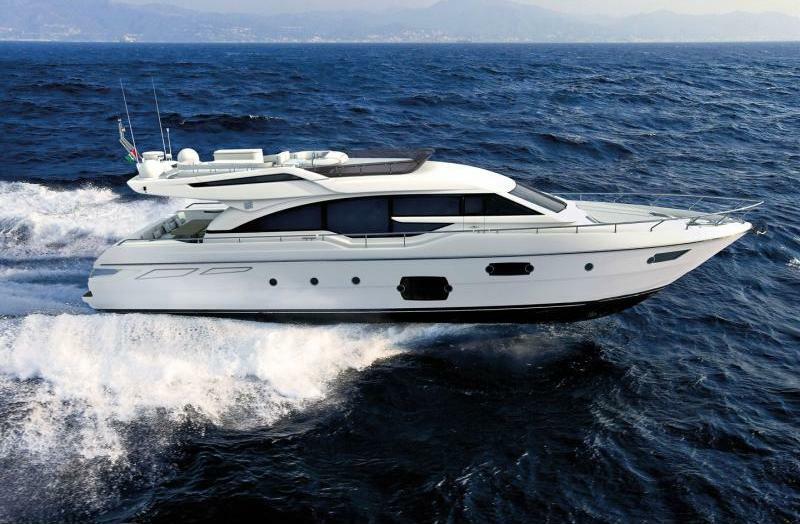 Ferretti 690 proudly follows in the way of 660, the evolution of Ferretti 631. These models are the symbols of Ferretti Yachts successful range of small crafts. We decided to renew the outer look of the craft and further improve the typical internal layout with an aft galley on the main deck and a full beam owner cabin underdeck, with two available interior layouts, with three or four cabins. 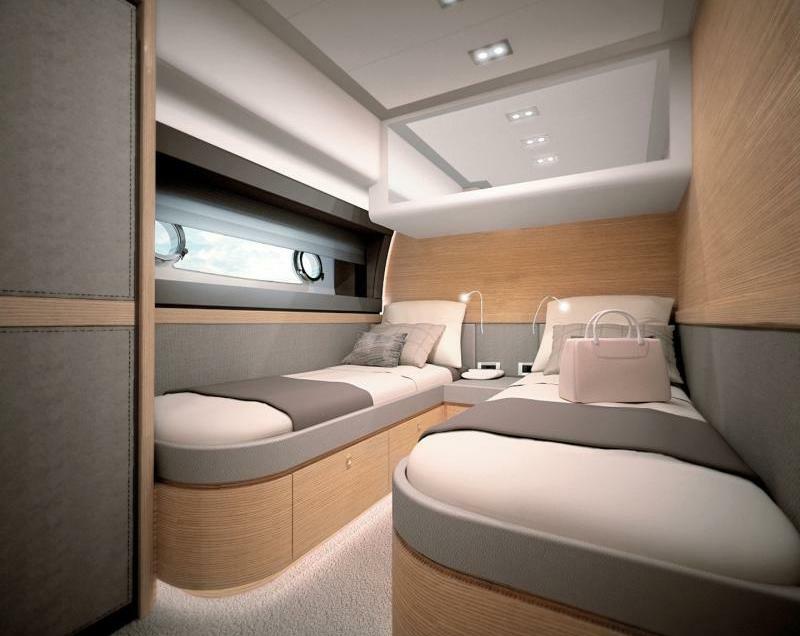 This choice will allow us to better match the demands of the Owners, who can now choose either the catchy three double cabin version, with large private heads, or the four cabin version, designed to cope with the needs of those customers who will appreciate the functionality of four comfortable cabins in a craft under 70 feet”. The interiors of the Ferretti 690 Project – approximately 21 metres long and 5.5 metres wide – are spacious and wisely organized, in order to exploit living areas at their best in both layouts. Volumes are notably enlarged by the natural light coming in from the wide windows. The interiors are furnished with a warm grey oak, which can be matched, upon request, with the parquet floor on the main deck and underdeck (carpet floor is available as standard). The cockpit features interesting innovations, some of which had already been adopted by the latest models of the brand. 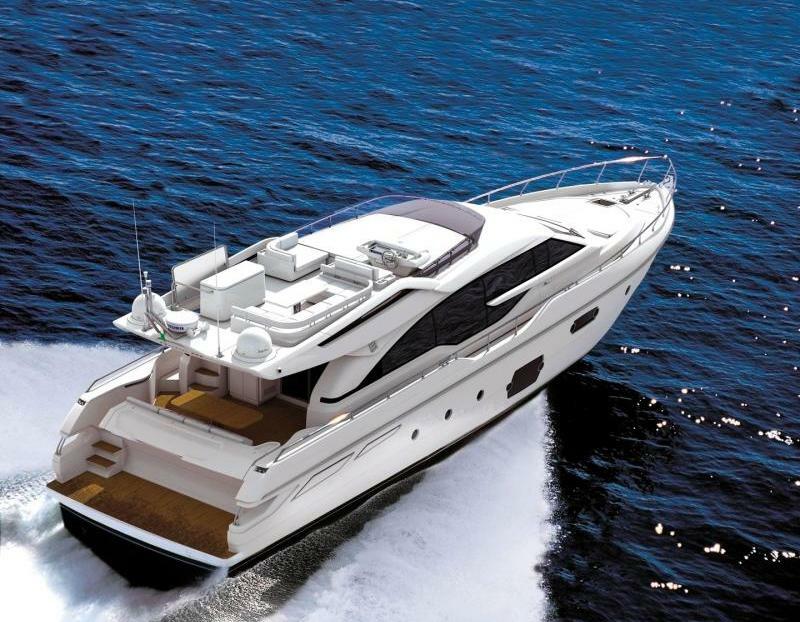 As in the case of the 620, the Ferretti 690 tender davit is not integrated in the gangway. It has been lodged in a dedicated housing, behind a spacious aft bench. This relevant upgrade optimizes the use of spaces, just like the shifting of the retractable passage gangway to the left. These changes allowed adding a large teak eight/ten-seat table. The gangway itself is a further innovation, even compared to the 620. The new retractable version makes the exterior profile of the yacht far more elegant. The Ferretti 690 features another absolute innovation at the stern, which will meet the taste of those owners looking for functionality matched with more “entertaining” aspects of the life on board. It is a tilting support in the swim platform, which can be lowered to create a surface below the water. This solution will allow “standing” on the water or comfortably seating in the middle of the sea. Launching the tender will also be easier by lowering the platform. This solution also allows lodging a larger tender on board. 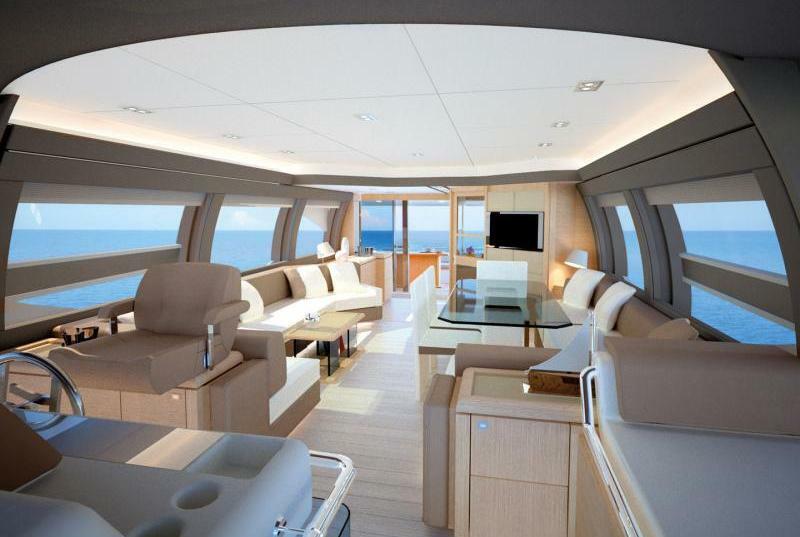 A sliding glass door allows entering the saloon directly from the cockpit, leaving space to the left to a comfortable bar unit, which can be equipped with an icemaker, just close to the galley, which can be accessed through a tilting hatch. This solution, which characterises Ferretti Yachts crafts under 70 feet and which has already been used in the opposite position on the Ferretti 620, makes life on board more comfortable and convivial. The crew area can be accessed from the right hand side of the cockpit, with a bunk bed cabin and a private head. The main deck, which is almost identical in the two layouts, with the exception of the access stairway to the lower deck, features a rational distribution of spaces. The galley is located portside, just after the entrance. 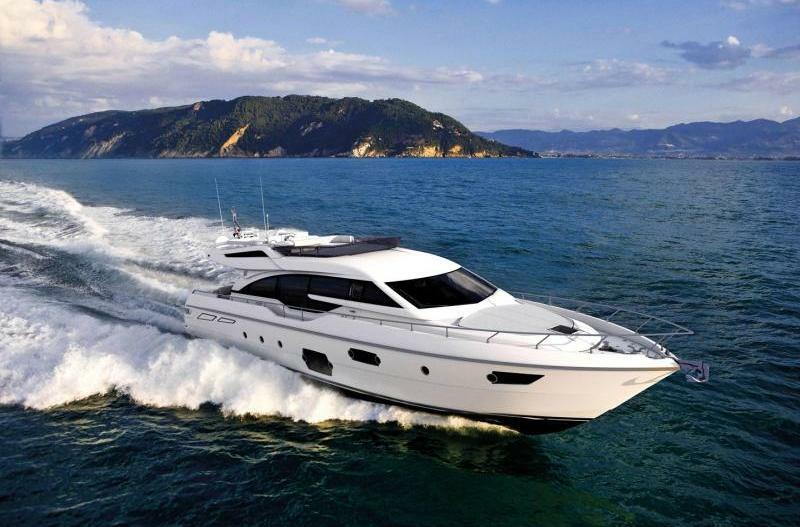 Its elegant lines make it incredibly wider compared to the previous Ferretti 660. A vertically sliding glass partition allows separating this area from the rest of the saloon or leaving it open, turning the main deck into a large open space. In front of the galley there is a functional cabinet, reaching the height of the sofa, which can be equipped with an optional bottle fridge. The dining area and the sofa are located in the central part of the deck, enjoying wider spaces and featuring the utmost comfort for the guests. The sofas and the tea table are located starboard, in front of the glass table, which can host up to six/eight people. The TV set has a highly functional position, on the oblique wall of the galley, thus being perfectly visible from both the dining table and the sofa. The helm station is located to the right hand side, with a direct access to the outdoor areas through a door along the starboard passage. This solution is usually featured by larger vessels. The shift of the helm station to the right, compared to the previous model, has been studied to increase the flexibility of the fore portside area, where, according to the layout chosen by the Owner, the stairs leading under deck can be located against the wall – in the three cabin model – or in a more central position – in the four cabin one – leaving space for a deck to the left. 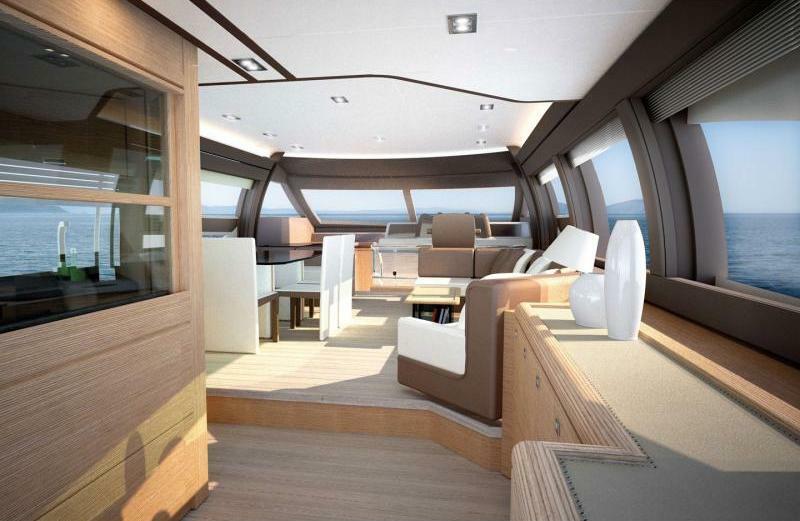 The layout of the lower deck confirms the versatility of the Ferretti 690 Project. The two options did not change the layout of the Owner and of the VIP cabins, since they are based on a different position of the stairs leading underdeck and on a different design of the lobby, of the guest cabins, and of the heads amidships. 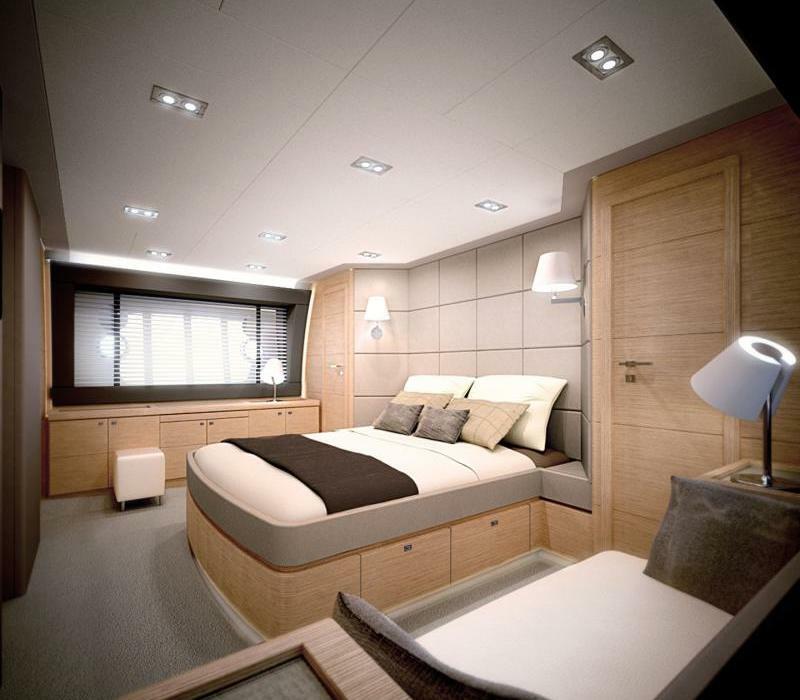 Each cabin is equipped with wide windows with porthole, to light up the room. The interior fitting is the result of a painstaking design, leather is the protagonist of all cabin furnishings. This material has been chosen for furniture tops and doors. The heads feature identical solutions, like the suspended washbasins and the accessories by Capannoli. The full-beam owner cabin is located amidships and is now even more functional and spacious, thanks to extensive changes in the furniture arrangement and the layout. The open view windows located on both sides feature opening portholes ensuring better air circulation and an incredible brightness. The decision to place the bathroom – with separate shower – and the large walk-in wardrobe towards the stern, behind the bed, increases the Owners’ privacy and the distance between this cabin and the engine room, which are now separated by the cabin’s head, the sailor’s cabin and the tank, a solution which also results in reduced noisel levels. The cabins furniture is completed by a chest of drawers and a vanity unit on one side and a sofa with cabinets on the other. 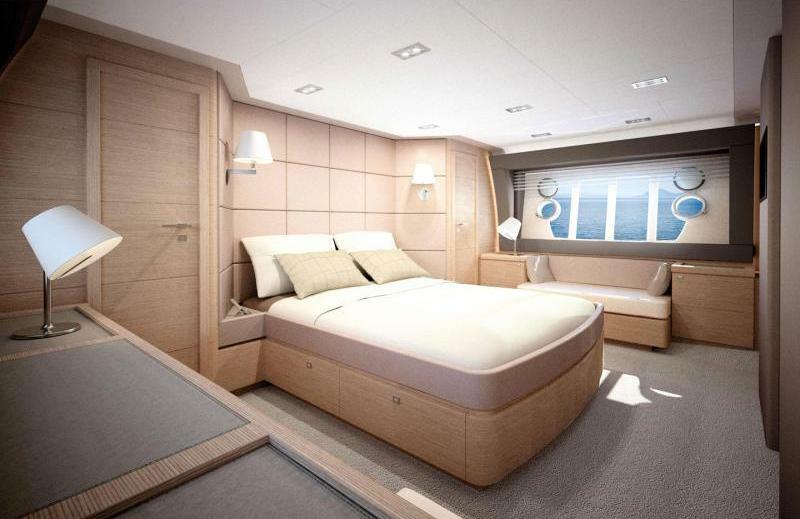 Moving forward, the VIP cabin is located at the extreme bow and benefits from two large side windows with portholes. 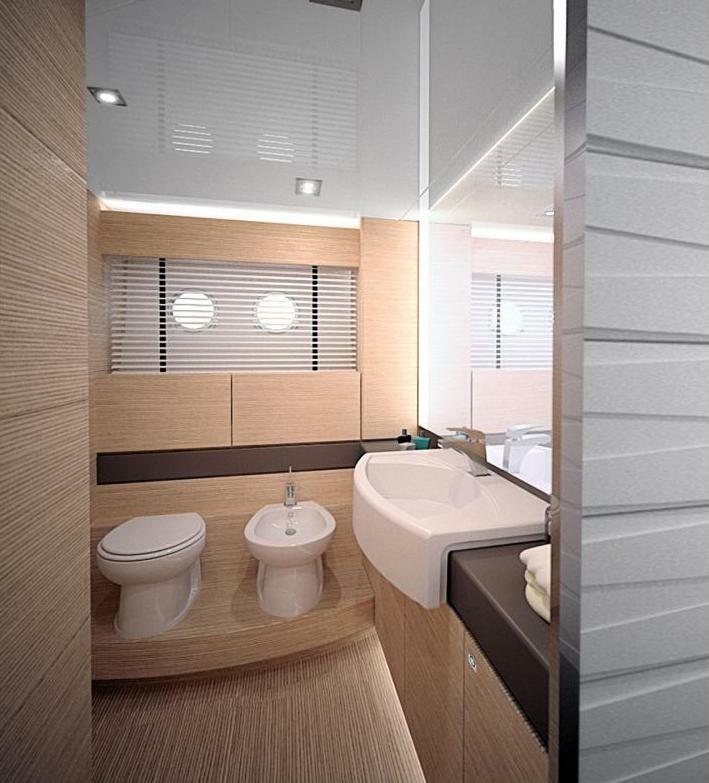 In the three-cabin layout, the VIP cabin also features a bathroom with separate shower. The same solution, in this version, can be found in the guest cabin – with double bed convertible into two twin beds – which is lit by a window with two portholes. The three-cabin version features a spacious lobby with glazing and two portholes on the port side, while in the four-cabin version a central corridor with two steps leads to the aft Owner cabin and two side doors give access to the large twin guest cabins. The flybridge has been extensively renewed and bears witness to Ferrettis great care for indoor and outdoor layout optimisation. Only the bar unit located near the access staircase has been maintained from previous models; everything else has been entirely redesigned so as to ensure all guests the utmost comfort. On the right hand side, behind the second helm station, stands a large C-shaped sofa with a tea table. The seat exploits all the space available up to the stern and allows to place a co-pilot sofa at the bow, on the left, and a really spacious sun pad beyond the helm station. This solution was achieved also by eliminating the stairs leading from the saloon to the flybridge, which are very rarely used on crafts of this size, and by adding a functional hatch. An additional large sunbathing area is located at the extreme bow. Last-generation engines have been selected for this new project. 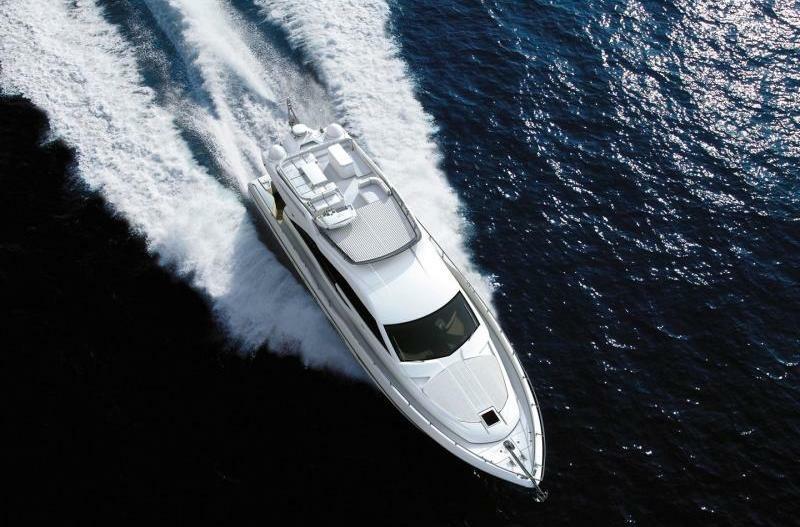 The Ferretti 690 will be equipped with two MAN 8V, 1000 mph in the standard version, 1200 mph as an option. When fitted with the standard engines, this yacht will reach a maximum speed of 28.5 knots (with a range of 285 nautical miles) and a cruising speed of 25 knot (in this case the range increases to 300 nautical miles). When the optional engines are installed, the maximum speed will be 31.5 knots (with a range of 250 nautical miles), the cruising speed 27 knots (range – 285 nautical miles) (preliminary data). The new set of more compact engines will also allow to save space in the engine room, where a second optional genset can therefore be installed, making the Ferretti 690s technical features comparable to those found on much larger yachts.